Katharine Beutner grew up in Pennsylvania. She earned a BA in classical studies from Smith College, a masters in creative writing and a PhD in eighteenth-century British literature in from the University of Texas, and will be teaching at the College of Wooster in Ohio. 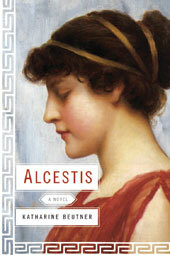 Her novel Alcestis, a retelling of the Greek myth, was published by Soho Press in 2010, and is now available as a trade paperback and Iambik audiobook. Alcestis won the Edmund White Debut Fiction Award and was a finalist for both Lesbian Debut Fiction Award from the Lambda Literary Association and the Compton Crook Award from the Baltimore Science Fiction Society. EB: When did you decide you wanted to become a writer? EB: How did you come to write Alcestis? KB: I started writing it in Ashland while I was in my last month of working part-time at SOU. I read Euripides’ play during my lunch breaks, and my frustration with its elision of Alcestis herself inspired me to think about writing a version of the story that followed her into the underworld. I wrote about five chapters of the book before entering the master’s program in creative writing at UT, and then I finished and revised the book as my thesis project there. EB: Your version of the myth is very different from Euripides’. It’s a feminist reimagining of a character who is very silent in Greek myth. What would you like readers to understand from your version as opposed to Euripides’? KB: I suppose I want readers to think about what it might really have been like to be a woman (or a man!) in Alcestis’s society, which is profoundly hierarchical and deeply divided by gender. Alcestis’s husband and father may love her, in their different ways, but they don’t have an understanding of her as a human being because she’s a woman. For them, the realm of the human is the realm of men. EB: Alcestis is also a study of psychology. How did you settle on first person point of view? KB: The book was originally written in third person, as the prologue and epilogue are, but when I workshopped the first three chapters at UT, my classmates told me that they felt too distant from Alcestis and her emotions. So I changed those chapters to first person, which required very little rewriting — they were already in tight third — and that improved the emotional immediacy for readers. It seemed clear to me after that that the book was meant to be entirely narrated by Alcestis in first person. EB: Your publisher is the wonderful SOHO Press, which is best known for crime fiction. How did you happen to connect with SOHO? KB: My agent Diana Fox submitted Alcestis to a number of publishers, and Soho was the first to make an offer! They’ve been wonderful, and I hope to continue working with them, especially since my next book is more crime-oriented. EB: What did you learn during the writing and publishing process? KB: That in the last weeks before the final revised version of a book is due to your publisher, you will suddenly begin to see how, if you had another two or three years to work on it, you could transform the book into something shining and perfect — in other words, into a completely different book. But given the circumstances, you have to do your best with the book you wrote. Before Alcestis, I don’t think I fully understood what writers meant when they said that a book could always be improved — I’m very proud of it, but it’s hard not to keep working toward that impossible perfection. In order to be a working writer, though, you have to let go and move on to the next project. EB: You recently finished your doctoral dissertation. Can you tell us a bit about that? KB: It’s a study of four early eighteenth-century women writers who satirized other women in print. Critics haven’t paid a great deal of attention to these rivalries, or have ascribed them to competition over men rather than clashing literary ambitions. My dissertation analyzes these women’s literary careers and their attacks on one another. I didn’t read their works looking for antagonism — when I started thinking about my dissertation project, I just knew I wanted to write about these women — but I think their rivalries tell us a great deal about how difficult it was to be a professional female author in the early 1700s, when writing for pay often carried a tremendous social stigma. EB: Has having a PhD in literature been a help as a writer? Or has being a writer helped you as a researcher? KB: For me, the two processes — critical analysis and creative writing — are fairly separate. My academic nerdiness absolutely influences my tastes as a writer and reader, and I’m academically interested in the process of writing and the lives of writers, but I’m not sure my creative writing process has been directly affected by my time in grad school. My time as an intern at the Harry Ransom Center, UT’s rare books and manuscripts collection, taught me a lot about archival research, though, and led to my discovery of the news story that inspired Killingly. EB: You’ve got a lot going on—writing fiction and nonfiction, recently completing your PhD, starting a new teaching position at the College of Wooster. How do you balance everything? KB: Not to be too glib, but: running and yoga really help. And having some kind of organizational system for your time — I would forget many, many things if I didn’t write everything down in my paper planner. One of these days I’ll probably switch to digital, but I like having the paper record of my time. EB: You have a wonderful blog and seem to really connect with readers. I know that a lot of writers find being an author even more work than writing books. What have you found? KB: Thank you! Actually, I’m a little desultory about blogging — I enjoy it, but I’m not willing to put in the kind of time and effort necessary to maintain a really compelling narrative blog. Occasionally I’m motivated to write a more in-depth essay post, but in general I use my blog to chatter about books and academia and writing and just hope that the people who read it will want to chatter back at me sometimes. A popular blog takes on a life of its own and can take over your life as a writer. You’re absolutely right that “being an author” is a lot of work, so I’m happy to answer email and do interviews and talk to book clubs and talk on Twitter and ramble on my blog, but I’ve chosen not to try to be a “blogger” in any serious way. I really admire writers who are able to do that and do it well. EB: You are working on a book called Killingly, based on an 1890s missing person case. Can you say a bit more about that? KB: It’s about a Mt. Holyoke College junior who disappeared in 1897 and was never found. Even years later, there were still news stories speculating about her absence. I’m not attempting to solve the case — I’m introducing some fictional characters and doing plenty of speculating myself — but I’m hoping to tell a really good, twisty, gothic story about this girl and her world. EB: Who do you read for fun? Or do you? KB: For a year or so while I was working on my dissertation and teaching I didn’t have much chance to read, but I’ve made more time for it in the last year. I spend about half my reading time on older books I’ve somehow missed — often Victorian novels, lately — and the other half on newer releases. I loved Sarah Waters’s The Little Stranger and Emma Donoghue’s Room and Justin Cronin’s The Passage. I also read nonfiction for book research, which counts as fun. Recently I’ve read a bunch of post-apocalyptic and/or dystopian young adult novels — initially for fun, then after I was hired at Wooster I decided to make a more systematic study of the genre. I’m now planning a course on teenagers in dystopian fiction for the fall semester. EB: Alcestis has been characterized as the Greek “good wife,” which made me think of the television show. If your book were a film, who would you want to play Alcestis and Persephone? KB: That’s surprisingly difficult to answer! Persephone looks like a very young, blonde Charlotte Rampling, maybe. I’m not sure I’ve ever seen an actress who reminded me of Alcestis. The closest I can come is teenage Charlotte Gainsbourg, but she’d have to have wilder, curlier hair. EB: Any final thoughts? Or advice for Ashland’s writers? KB: My basic advice for all writers is to read all the time — and if you’re lucky enough to be in a place like Ashland that’s frequently visited by authors giving readings and talks, go to those too. You never know how someone else’s work might inspire you. Lovely interview; many thanks to both of you! Can’t wait to read “Killingly”.